An abundance of leaks is almost customary at this point, as OnePlus reportedly gears up for the release of its next flagship smartphone next month. Rumours are suggesting that there will be three devices in the OnePlus 7 line-up, a first for the company that casts doubt on the iterative end-of-year T-variants we’re used to seeing. 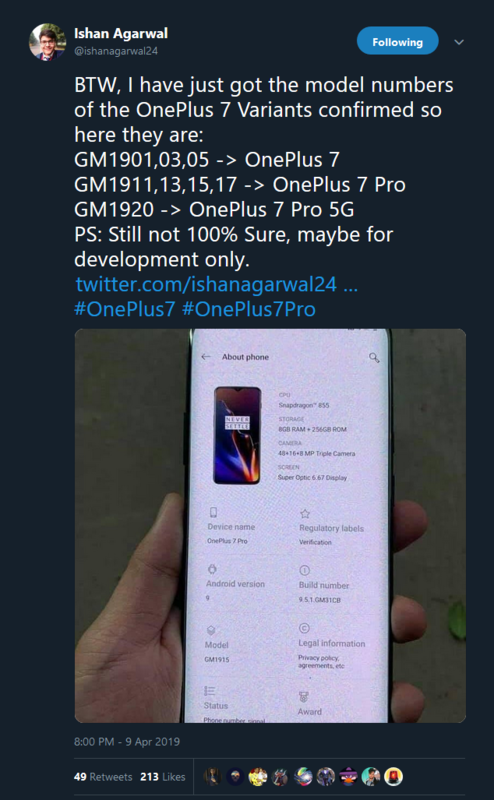 Last week, Ishan Agarwal uncovered a leak on Chinese social media site Weibo that showed a supposed OnePlus 7 device in action. 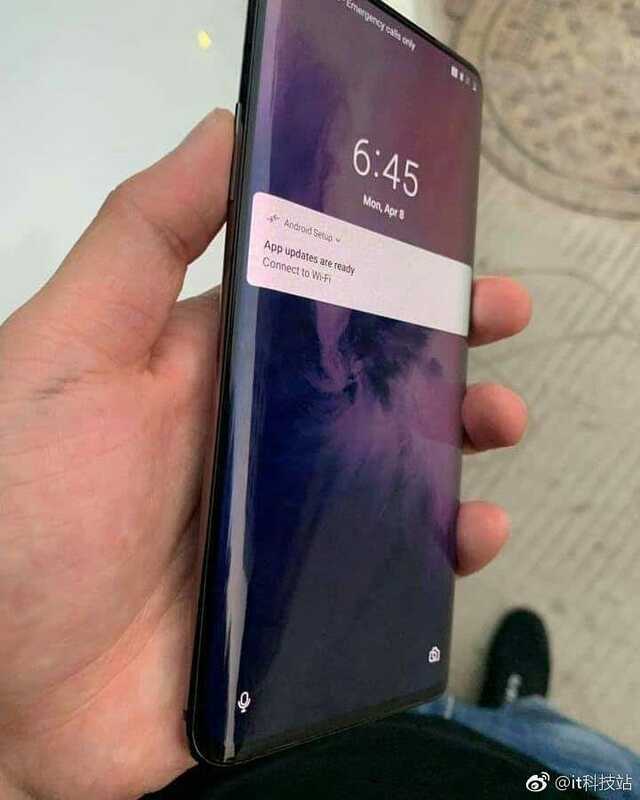 It sports a curved edge-to-edge screen, departing from the teardrop notch seen on the OnePlus 6T in favour of a pop-up selfie camera. 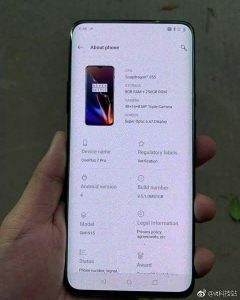 In particular, the “About” screen in the photographs suggests that this is the OnePlus 7 Pro, a higher-end smartphone that is said to accompany the standard model at launch. 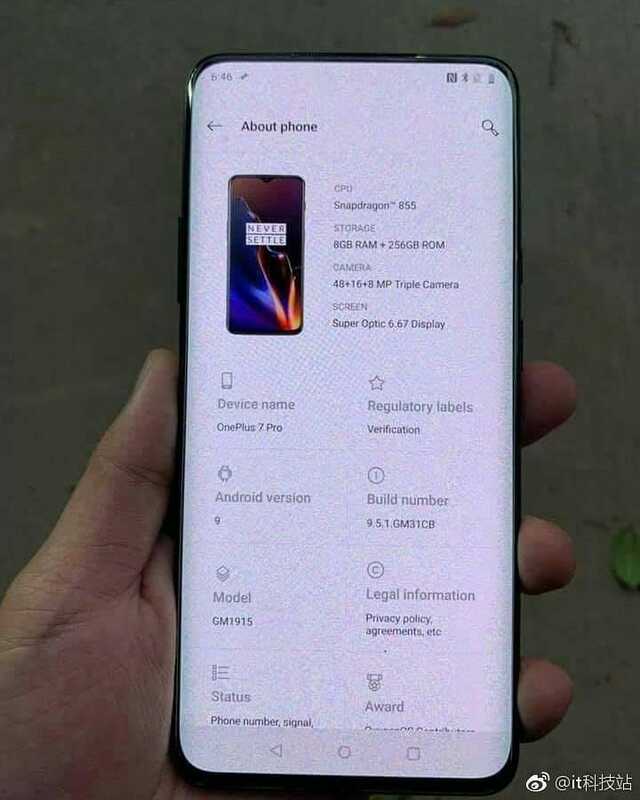 It is believed that the OnePlus 7 Pro will feature 6.67in Super Optic display, powered by a Snapdragon X55 processor, 8GB memory and 256GB storage. It will supposedly house a triple rear camera setup, consisting of a 48MP primary lens, backed by 16MP and 8MP sensors. Although some rumours have suggested that the standard OnePlus 7 will also feature a pop-up front-facing camera, new leaks from Pricebaba and OnLeaks describe the handset with a teardrop notch similar to its predecessor. It is said to be noticeably smaller with a 6.2-inch display with a dual camera setup on the rear. 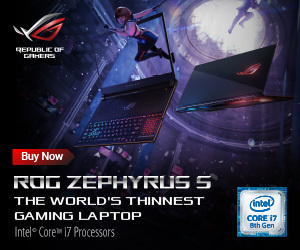 Despite its reported size, it will still likely contain a 4,150mAh battery and even range up to 10GB of RAM, although the base version sports 6GB. Agarwal’s input didn’t end there, as some digging revealed that there are potentially 3 separate models in the works, with a premium version housing 5G technology rounding off the range. This lines up with previous rumours that OnePlus is set to join the 5G coverage race as soon as possible, but the leaker seems uncertain given that there is no additional information. Historically, there has been no consistency to the launch of OnePlus flagships from the original smartphone debuting in April 2014 to its successor in July 2015. This makes it much harder to corroborate the leak, but doesn’t eschew the possibility of a May launch. Pricing is still unknown and remains a particular mystery given that this is the first time that OnePlus will release a slew of smartphones at the same time. 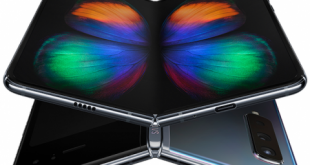 The release of two, or even three flagship devices could see the company avoid a potential OnePlus 7T, as it will undoubtedly cover all markets with its anticipated line-up. All of this information should definitely be taken with a pinch of salt, at least until OnePlus’ supposed May 14 launch. KitGuru Says: Hopefully OnePlus still maintains its reputation as the price to performance kings. 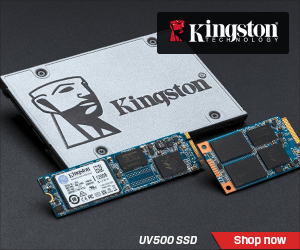 At the very least, fans aren’t like to scoff at more options, especially if it means they can get their hands on the same quality of build with all of the latest and greatest features. Are you looking forward to the OnePlus 7 series?